Carthage From Byrsa Hill, where you will find the best remains from the Punic era. This, however, is a Roman temple with a grand view over the Gulf of Tunis. And they really did – destroy Carthage. It is hard to imagine that this place housed the most beautiful and the richest sea port of ancient times, lasting for centuries until the destruction by the Romans in 146 BCE. Carthage was destroyed because this capital had a tendency of surviving any hardship caused by the Romans. And as Carthage was Rome’s greatest contender for regional control and power, Rome felt that it could not rest until 3 years of destruction, concluded by 17 days of conflagration, had wiped Carthage out. For a little bit more than 100 years Carthage was nothing but ruins and rubble. The Romans made Utica their capital. Then in 44 BCE, a Roman city was established where the Punic one had been. The reconstruction was highly successful, and Carthage would rise to becoming the third largest and most important city around the Mediterranean Sea. Estimates show that between 200,000 and 700,000 lived here. So as the story goes, when Rome was crushed in the 5th century CE, Carthage thrived and prospered. Not before the arrival of the Arabs, did Carthage come to a final end. But trying to discover the old Carthage, is difficult. Even if the ” destruction” left some of the structures of Carthage in good shape, the need for building material removed both ancient Carthage and the younger Roman structures. For a long time, the world believe that all of the original Carthage was gone, and no few archaeological missions were launched before 1857. What Roman Carthage may have looked in the 2nd century CE. Launching ramp for ships from the cental island. Ships landed here were often in for repairs. Looking past the central island in southern direction. Representation of the port of Roman Carthage, 2nd century CE. It used the same structures as the Punic port had. Trying to understand what Carthage was like, the Punic port may be the best place to visit. Carthage was by far a stronger sea power than Rome for centuries. From trade over the Mediterranean waves, created the wealth of Carthage. But the remains you see now, are of the Roman port structure. Especially, the circular island, is often used as an illustration of Carthage’s greatness before the Romans destroyed it all. The Punic port is very much moulded by man, and is a 100 meter wide canal shaped like a perfect circle. The inner part, 130 metres in diameter was both the quay, and the dock where repairs were done. Even if this structure appears small, it was big enough for up to 220 slim ships at one time. Little remains except a couple of anonymous stones lying randomly on the ground, as well as a couple of places where there are clear traces of the docks. These give clear indications of the size of the ships, as well has how they were docked. Next to the port, there is a small museum with a model showing you how archeologists belive that the port was in Punic times. Fishing on the western side of the central island of the Punic Port. The opening to the ocean is most likely a modern invention. You can just about make out the whole port arrangement looking at it from Byrsa Hill. The cirular island in front, while the rectangular basin furhter on. Most modern archaeologists agree that child sacrifice was performed by the Carthaginians at the spot of the Tophet, just a few hundred metres from the Punic port. At this spot, hundreds of headstones over childrens’ graves are still standing, and in the ground one has found bones of both animals and children. We hear of child sacrifice from both legends and Roman stories. But while these rituals most likely have been performed, they were hardly as common as claimed. It is believed that they were only performed in times of extraordinary hardship. In many cases, the Carthaginians used lambs or kid goats as replacement sacrifice, and in some cases perhaps even dead children. The Tophet lies next to a sanctuary dedicated to Baal Hammon and Tanit, but from this, little remains. The name ‘Tophet’ is not the original name, but comes from the Biblical name for sanctuaries of child sacrifice in the Middle East. We do not know what the Carthaginians called this place. These baths were once the very largest in the Roman empire. The main pool was as big as an Olympic pool. The curved public latrines were at first take for a theatre. Very little of the upper structures remain, but the lower halls are so huge and extensive that it is hard not be amazed. The baths were constructed from 145 to 165 CE, and is perhaps the best illustration as to how rich and wealthy Carthage was during the Roman era. They were the largest in North Africa, and third largest in the whole Roman world. Due to being so low compared to the sea, the heating and service areas were built above ground. Small pieces of Punic columns. You would just about make out two circles on the one furthest to the left. In front, are some Roman pieces. Great balls of fire? Well, yes. These stone balls were covered in burning material, set on fire, before being launched at enemies at war. The centre of the Punic Carthage was at the present Byrsa Hill, a hilltop from where there are great views of what today is known as Gulf of Tunis. Although the Romans claimed that their destruction of the Punic city was complete, modern excavations has in fact been able to dig down to genuine Carthaginian quarters. It is not much, but still the more fascinating to see (lower photo). Each of the Punic houses had their own cisterns and could rise up to 5 storeys of height. The reason why this little quarter survived until modern times, was that the when the Romans decided to rebuilt Carthage 100 years after its destruction they leveled the top of the Byrsa Hill, and what wasn’t destroyed then was saved beneath the rubble. In addition to these small quarters, the southern platforms contain a large number of fragments of columns, some Punic and some Roman. The very, very best preserved part of Punic Carthage. A Punic Bes, a protective god probably with origins in Egypt. It was used by commoners, and could serve as a protection of a house and a family. Vases and statues of Punic origin. Remains of Punic columns, illustrating well how complete the Roman destruction of Carthage was. The main hall of the museum, with a splendid Roman mosaic on the floor. It is unfortunately badly lit, and trying to see it from the staircase is actually best done through binoculars. To be a museum of the greatest Punic city, the Carthage Museum disappoints. And the reason is as ever the Roman destruction of 146 BCE. Yet, there are more than enough bits and pieces here to start creating an image of the distant past. The smaller the item, the more likely that it has survived in one piece. Small statuettes, vases and oil lamps are dominating the Punic sections. Styles are simplistic, yet not too different from Roman counterparts. Larger items on display at the museum are mainly from the Roman era, including statues (of which some are large, take a look at the one on top of the staircase) and mosaics. All in all, the conclusion is still that this museum is nothing compared to the quality of exhibits and presentation in the Bardo Musuem in Tunis. Its name indicates that its original purpose is not known. This structure, right on the highway, may have been the Baths of Gargilius. In that case it has played a role in Christian history, being the place where St Augustine called a conference of bishops in 411 in order to defeat the Christian Donastist orientation. The theatre is a strange stop. It has been rebuilt so extensively that you cannot make out what is original and what is new. It actually looks as if everything you see is new. On the other hand, the theatre is in full use. Shows are held here all the time, and when evenings come and lights are lit, new and old merges after all. The Archaeological garden is marked on most routes around Carthage, but must be considered the least interesting stop of them all. When I visited in September 2005, much of the space was given over to some ongoing construction work. The remaining part was a tiny little garden with a few statues placed spread out. Nothing was labelled. The fact that the cathedral of St. Lous on the hill over Carthage still stands is rather surprising. It is indeed a monument over some historical incidents that the present Tunisian state would have all possible reason to disapprove of. It was built in the 1890′ on the spot where the French king Louis 9 died in 1270. He was setting out on a “” where he attempted to convert the Muslim Hafsid ruler El Mustansir. During the siege of Tunis, the king died, and was later canonized. In the 1930′ a grand conference was held here by the French Catholic Church, that proclaimed the revival of Africa’ Christian heritage. It is said that this conference provoked Habib Bourgiba, and gave strength to his nationalist feelings. Today the cathedral is used only for cultural purposes. Quite little in Carthage itself. 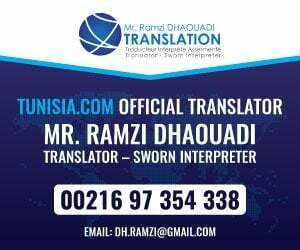 The hotels you find right here are rather expensive, and you might like to consider rather staying in La Marsa (5 km) or Tunis (17 km). Among the hotels here, the Résidence Carthage offers best value for money. Nothing, except in the hotels. 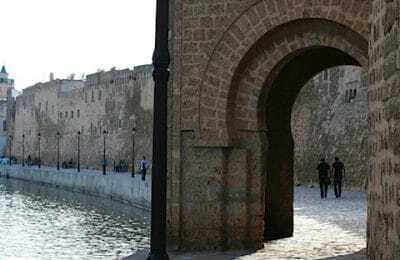 Tunis is your best chance, and even that is not terribly great. Beyond the hotels, there are no great places to eat in Carthage. Good alternatives are Sidi Bou Said (2 km) or Goulette (6 km). Use the local train. This is great also for moving around the sites of Carthage. There are 6 stops along the railway for different parts of old Carthage. and Carthage Byrsa will take you to the Punic port, the Tophet, Hippodrome and the Paleo-Christian Museum. is good for the 1890′ Cathedral and the excavations. 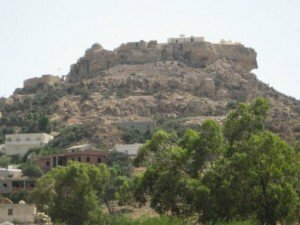 is good for Damous el Karita, the largest ancient church in North Africa. is good for Basilica St. Cyprian and Basilica Majorum.